We take an intelligent approach to lead generation through data-driven pay-per-click campaigns, thoughtful web design, and performance optimization to make it all work smarter for you. PPC marketing can quickly boost traffic to your website or landing page. More traffic, however, does not always mean more business. At ThinkSEM, we’re skilled at generating high-quality leads that are more likely to convert, so that our clients enjoy a better return on investment. Since 2007, we have achieved impressive results for PPC clients ranging from Fortune 500 corporations to small and mid-sized companies and nonprofit organizations. Clients rely on us to produce cost-effective leads and we deliver. Our agency is proud to be a Google Premier Partner and a Bing Ads-Accredited Professional. In addition to creating PPC campaigns on the AdWords and Bing Ads platforms, we make strategic use of Facebook and LinkedIn PPC advertising. This multi-platform capability gives us the flexibility to develop a strategy that meets your goals for performance and budget. Our PPC advertising services include PPC management, strategy, lead generation techniques, AdWords management and text and banner PPC advertising programs in English and Spanish. Just starting out in PPC? We can help you take the first steps by setting up your accounts and campaigns correctly and providing effective keyword research. Need advanced support for a complex program that includes remarketing or RLSA? We have what it takes to provide sophisticated solutions and support on a large scale. Find out what our PPC advertising expertise can do for your business. Request an audit of your existing accounts or call ThinkSEM at 651.200.3831. Some websites are just a pretty face. At ThinkSEM, we design and build websites that look great and perform brilliantly. Every website we create incorporates best practices from the fields of design, development, user experience, information architecture and search engine optimization. Our web design is informed by more than a decade of experience in conversion rate optimization and landing page design. Want a one-of-a-kind website? 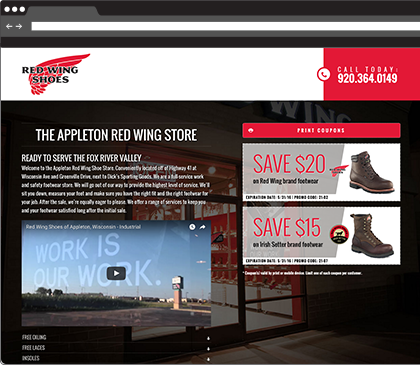 Our custom responsive websites are built from the ground up just for you. They incorporate the exact features you want and reflect your individual look, style and brand. There is no template and no limit to your options. We help you determine what you want and need in your website. We’ll ask about your audience, your company goals and your color and design preferences. Then we’ll design a website with the look, feel and function that’s just right for you. Need an affordable, professional-looking website fast? Select a theme from our library. We’ll customize it with your content, images and branding. In less than a month — often much less — your new website will be live online, generating leads, sales or sign-ups for your business. Both custom and Themes Plus websites are fully responsive, so they’ll look great on any device. Is it time for a new or redesigned website? Call ThinkSEM at 651.200.3831 or contact us online. Congratulations. You’ve reached your target market with a PPC advertising or email campaign. Now, how do you persuade those new prospects to take the next step? How do you encourage them to click on the call to action, submit the form, download the report or otherwise convert? 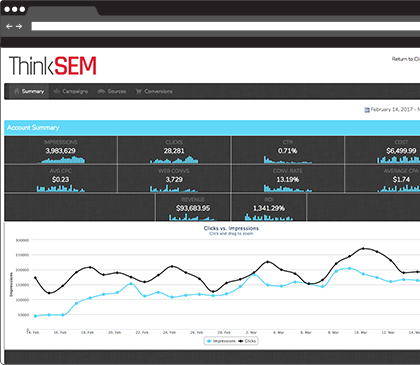 ThinkSEM’s performance optimization services can turn online visitors into solid leads or customers. Our data-driven approach can dramatically increase your conversion rate and return on investment. Landing page design and development: A landing page is where users go after clicking on your PPC ad, display ad or the link in your email campaign. It’s a controlled, custom environment designed specifically to support your campaign. Users have only two choices — complete the desired action or hit the back button. All page elements are designed to drive conversion. The words, images, colors, shapes and placement of elements work together to achieve your goal. Our landing pages can wring more conversions out of your campaign. You’ll be surprised how well they work. Landing page testing: Discover what real users prefer. Then modify your landing page to achieve better results. Our landing page testing programs take performance optimization to a whole new level of effectiveness. You can test different variations of a landing page (A/B/n testing) or multiple elements within a single page (multivariate testing). Strictly empirical, landing page testing eliminates the guess work and gives you actionable data that yields impressive results. ThinkSEM has more than a decade of experience helping clients increase conversions by testing and fine tuning their landing pages.